I spent two weeks of my December break in Vietnam with my best friend from high school. It was pretty fun. For one, this was the first time I got so much time with my best friend. Also, I love Vietnamese food. I liked the fact that Vietnam is a developing country. Developed countries to me have little sense of risk. Developing countries are different. They’re less organised, peoples’ lives are more interesting and there’s more to learn about them. Our flight from Singapore went en-route Ho Chi Minh City (where we were to later return) to Hanoi, one of the northern and capital city of Vietnam. We had a two hour layover in Ho Chi Minh which is a southern city of Vietnam, where we hoped to grab some lunch at the airport. That did not happen. My visa on arrival took far longer than expected. Vietnam requires several country’s citizens to either get a visa before landing in the country OR get an approval letter online which expects your arrival and makes you eligible to get a visa on arrival. I chose the latter option. First, I had to queue up to submit my visa application form and approval letter. Then, I had to wait for them to process it and call out my name with my stamped passport. The processing part took quite long, and I had to show them my boarding pass, which indicated that my next flight was boarding in 15 minutes. The authorities were being quite nice to people who had to catch another flight and rushed our applications. 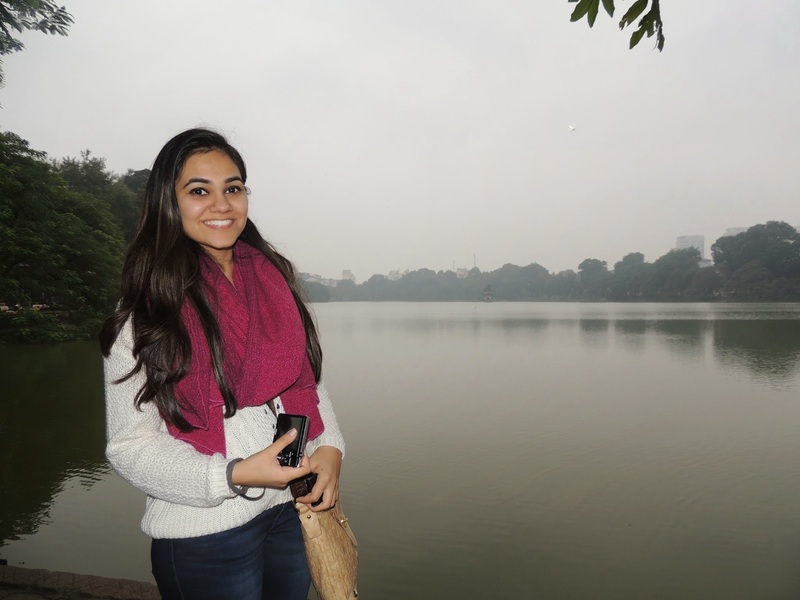 Once I had my visa, Shivani and I ran from the international to the domestic airport (which were right next to each other) in the rain. We had to check in again and go through security check again, which took some time. But we made it to our next flight, which is all that really matters. We reached Hanoi airport around 4:30 PM and took our time to leave the airport. At 5:30 we took a bus from the airport to the city, which is an hour and a half away. The bus was surprisingly cheap. 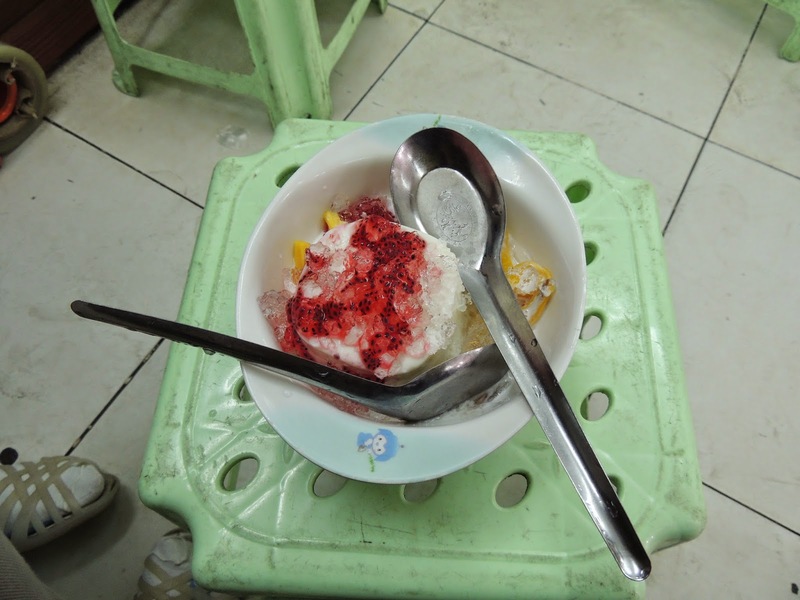 It cost us 2 USD per person (after we figured out that they were trying to overcharge us). By the time we reached the city it was 7 PM. 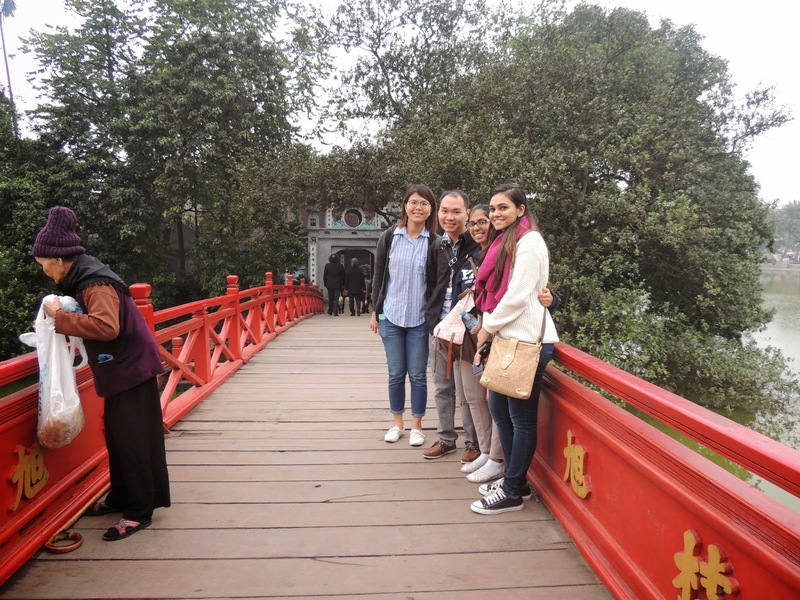 Our original plan was to take a train up to Sapa, a city 8 hours north of Hanoi. But just the night before our flight, we had discovered that train tickets to Sapa weren’t available online. 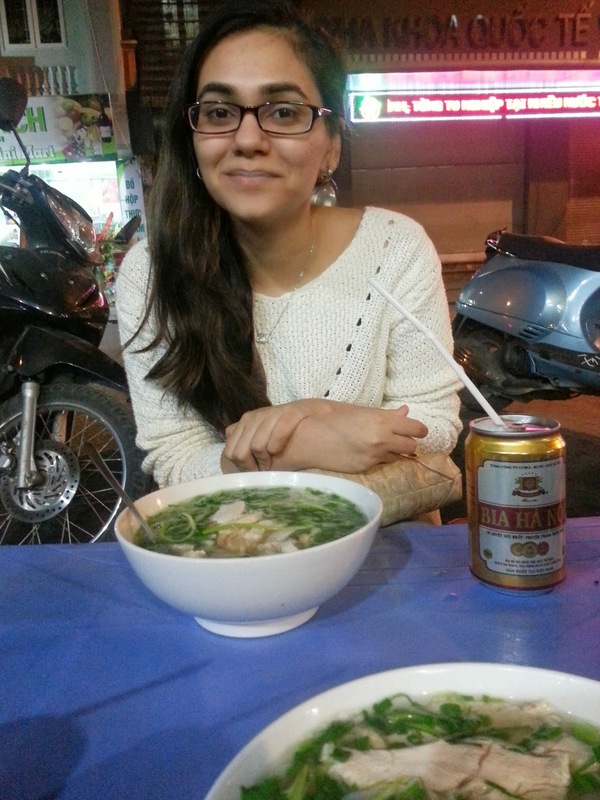 So we decided to spend 2 extra days in Hanoi which made it a total of 4 days. We later discovered that train tickets online sell out because local travel agents buy them and re-sell them. So we probably could have gotten tickets to Sapa had we known. But 4 days in Hanoi was good too. We ended up doing things all of the 4 days we were there. Hanoi weather was kind of cold. It was ~10-15 degrees celsius. The sun never comes out in the winter there apparently, and it was a bit rainy. Hanoi looks much like an expanded version of a small town of India. It’s very large, has lots of traffic and little shops falling onto the roads selling groceries, clothes, tools or anything else you might need to buy. There were hardly any high rise buildings or malls. There were lots of lakes, which was interesting to me because I’d never been to a city with so many lakes inside of it. This meant lots of nice parks and areas to chill beside lakes. Coffee and tea stalls were popular, so was street food. The street food in Vietnam is safe even for foreigners and quite low on oil. So we could effectively eat street food for all our meals and not fall ill. This is very unlike street food in India which should not be eaten on a regular basis. Meals on the street would usually cost less than $5 for both me and Shivani. Coffee was cheap too, but got more expensive in indoor cafes. I really loved Vietnamese coffee. It’s dark coffee with condensed milk. Its pretty heavy, so by the third day I started cutting down on my coffee consumption. 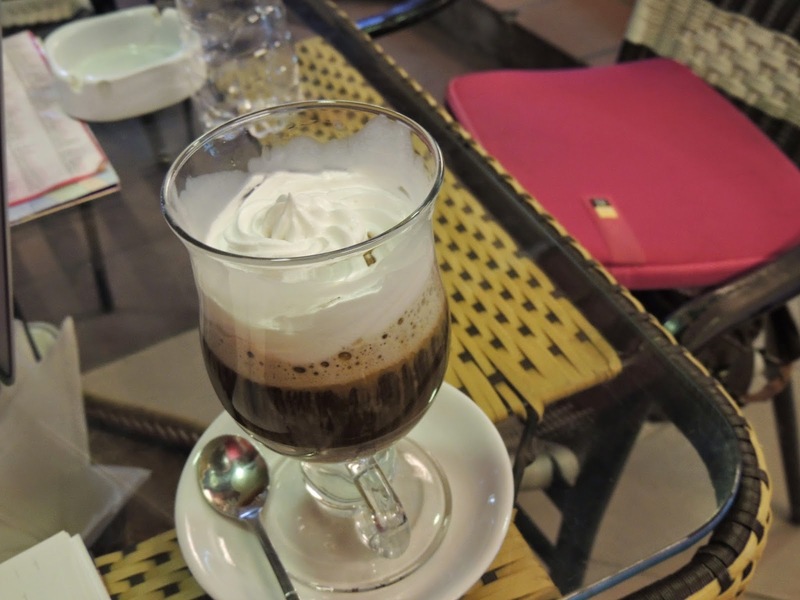 Vietnamese coffee is traditionally served with condensed milk. The filter (silver cup on top of the glass) is filled with coffee powder and hot water, which drips into the glass. Egg Coffee, a specialty of a popular Hanoi cafe. It was possibly the best coffee I’ve had. 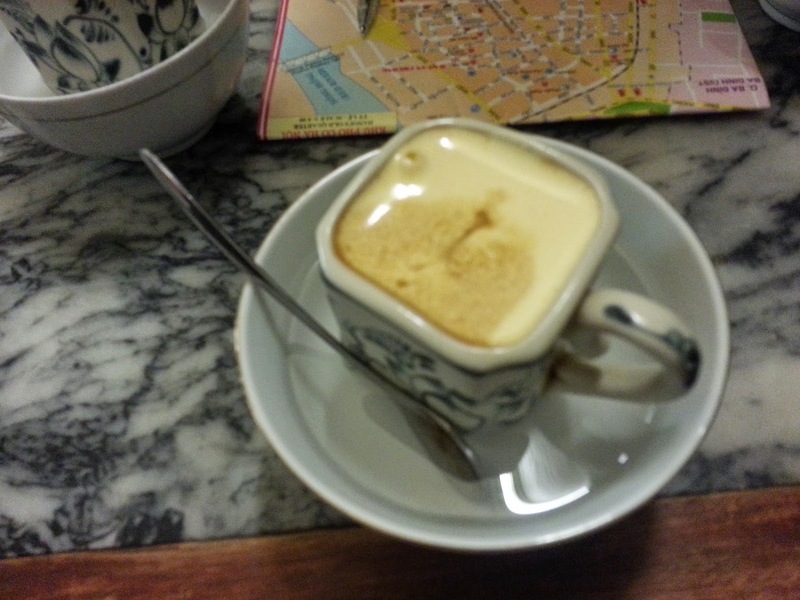 The foam, which fills half the cup, is made of egg and below it is Vietnamese coffee. Coconut Coffee, found at a cafe in Hanoi. I think it was just the cream which was coconut flavoured. There’s an area called the old quarter of Hanoi which has most of the hotels, hostels, the popular Hoan Kiem Lake, the Hanoi prison, the night market and lots of cafes and popular eating joints. My favourite place was the Hanoi prison, where I learnt a lot about the French acquisition of Vietnam and the Vietnam war. Another attraction is the Water Puppet Theatre which puts up shows of the traditional Vietnamese art of Water puppetry. As the names implies, it is a show of puppets in water. There is live music sung in the background and the puppetry depicts different aspects of Vietnamese traditional life. Personally, I didn’t really enjoy it much and didn’t think it was worth the $5 entry fees. There were no translations, so it was hard to understand what really was going on. We stayed in the old quarter for the first two nights and couchsurfed for the next two nights at a place a little outside of the Old Quarter. Hanoi’s couchsurfing community is pretty tight, and they have a lot of events and get togethers that we unfortunately didn’t know of until our third night in Hanoi. One of the first things I noticed about Hanoi was how laid back it is. People were clearly underemployed and pace of life seemed slow, atleast from an outsiders’ perspective. But I think that plays a major role in making Hanoi such a popular tourist attraction. I thought the hype behind it is a bit much, but I can definitely see where it comes from. It isn’t often that you come across a city with friendly people, convenient transport and cheap food.